What complications occur in type 2 diabetes? How likely is it that it will happen? Diabetes is a complex condition, affecting many parts of your body. When people are diagnosed with type 2 diabetes mellitus, the disease process may have been present for 5-10 years. This means some complications may already be present at diagnosis. When you have diabetes your blood sugars are elevated. Blood goes everywhere in your body so the effect of high sugars occur everywhere. A person with diabetes is at risk of many other health problems, including heart attacks, strokes, vision loss, nerve damage, and kidney disease. While this might sound overwhelming, there is some good news. You can take many steps to prevent any of these complications from occurring or becoming worse. Early diagnosis, optimal treatment, and effective ongoing support and management reduce risk of diabetes-related complications dramatically. Let’s take a more in depth look into what can go wrong in someone who has diabetes. 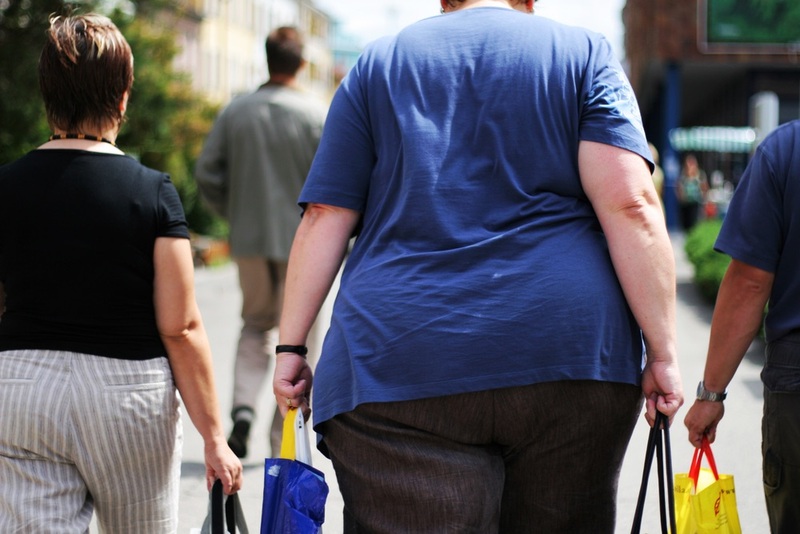 Metabolic syndrome, sometimes called syndrome X, is a collection of disorders, including high blood pressure, insulin resistance, abnormal cholesterol levels, and excess fat around the waist. People with metabolic syndrome are twice as likely to have a heart attack and stroke, and five times more likely to develop type 2 diabetes, compared to people without metabolic syndrome. Over the past three decades, the prevalence of Metabolic Syndrome has increased. Did you know that children and adults can also have metabolic syndrome? It’s not just adults! 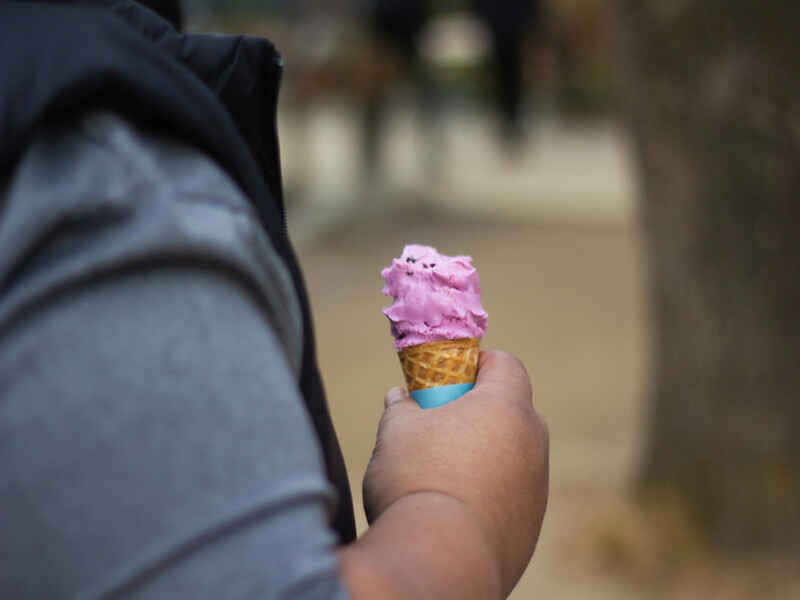 More and more young people are showing signs of metabolic syndrome. The incidence of metabolic syndrome often parallels the incidence of type 2 diabetes and obesity (The Global Epidemic of the Metabolic Syndrome). According to the Centers for Disease Control and Prevention (CDC), 12.2% or 30.2 million adults (aged 18 years and older) in the USA had type 2 diabetes in 2017. What’s scary, is that a quarter of these adults, don’t even realise that they have diabetes. Typically, adults with type 2 diabetes will present with comorbidities such as obesity, hypertension (high blood pressure), and dyslipidemia (elevated cholesterol and fats in the blood). A comorbidity is the presence of one or more additional diseases or disorders. Other comorbidities that may be present at diagnosis or can develop over time, include gum disease, sleep apnoea, fatty liver disease, depression and anxiety, and bone fractures (Comprehensive Medical Evaluation and Assessment of Comorbidities by the American Diabetes Association). If there are any complications present in a person with diabetes, the disease progression can be slowed by interventions, for example better management of blood glucose levels, blood pressure, and blood lipids. Diabetes is a vascular disease which means it affects blood vessels. Complications in type 2 diabetes can be described as microvascular (small blood vessels) or macrovascular (large blood vessels) complications (Microvascular and Macrovascular Complications of Diabetes). As mentioned, diabetes-related complications occur over time due to persistent high blood glucose levels, high blood pressure, and abnormal cholesterol levels. These complications are serious and can be life-threatening. Generally speaking, people with type 2 diabetes tend to experience macrovascular complications mainly but they can still experience microvascular complications too. peripheral artery disease which can lead to pain deep in the leg muscles (calves, thigh, or buttocks) during activity as well as amputations. Studies have shown that in people with type 2 diabetes, poor blood glucose control increases the risk of macrovascular complications (Glycaemic control and vascular complications in type 2 diabetes mellitus). Studies have also shown that by treating and controlling hypertension and dyslipidemia, can aid in reducing the risk of macrovascular disease. The main cause for these macrovascular diseases is atherosclerosis (Diabetes and atherosclerosis: epidemiology, pathophysiology, and management). Atherosclerosis is a build-up of fatty deposits in the blood vessels, typically the arteries. These fatty plaques can grow over time and result in narrowing of the blood vessels or completely blocking blood flow. Atherosclerosis can occur anywhere in the body. When it occurs in the arteries of the heart, it is called coronary artery disease. When it occurs in the arteries of the brain, it is called cerebrovascular disease. 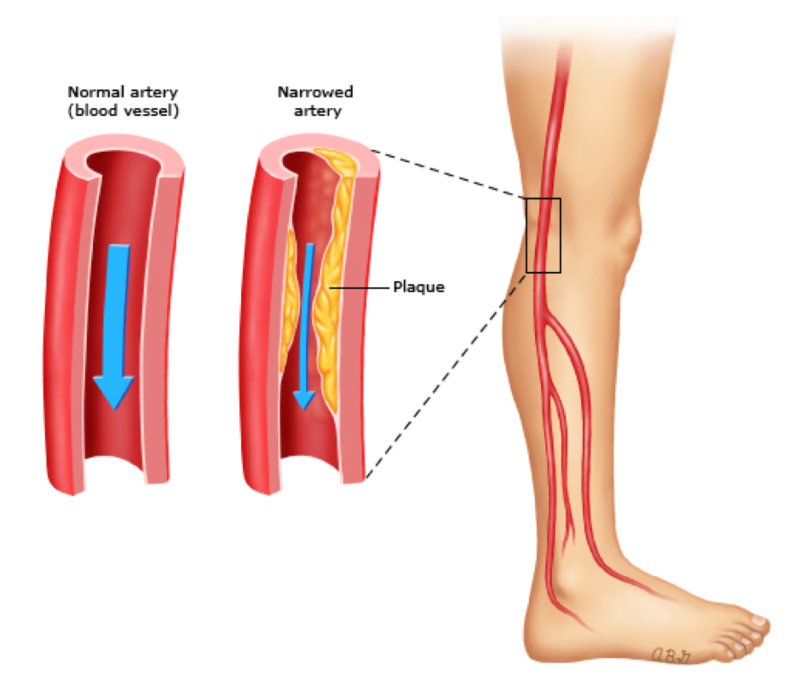 Finally, when atherosclerosis occurs in the arteries supplying blood to other areas of the body like the legs or kidneys, it is called peripheral artery disease. Coronary artery disease is a condition that puts you at risk of a heart attack and other forms of heart disease. 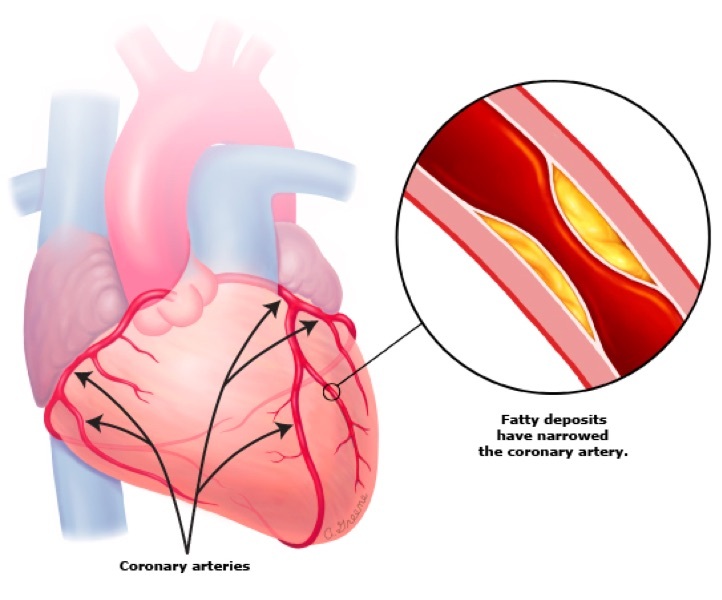 The coronary arteries supply blood to the heart muscles and when these arteries become narrow due to atherosclerosis, it can lead to a heart attack. Heart disease is actually the number one killer of people with type 1 or type 2 diabetes (Microvascular and Macrovascular Complications of Diabetes). Typically, the first sign that someone has heart disease, and even diabetes, is when they have a heart attack. Some people who have heart disease may experience chest pain even if they aren’t having a heart attack. This can happen while they are walking, going up stairs, or just moving around. If you experience any of these symptoms for more than 10 minutes, or they keep coming or going, or any pain in your chest you experience is new or different, contact your emergency services for an ambulance right away. Cerebrovascular refers to blood flow to the brain. Cerebrovascular disease refers to all disorders whereby the brain is temporarily or permanently affected by inadequate blood flow or bleeding in one or more of the blood vessels to the brain. This may occur due to a stroke or an aneurysm. 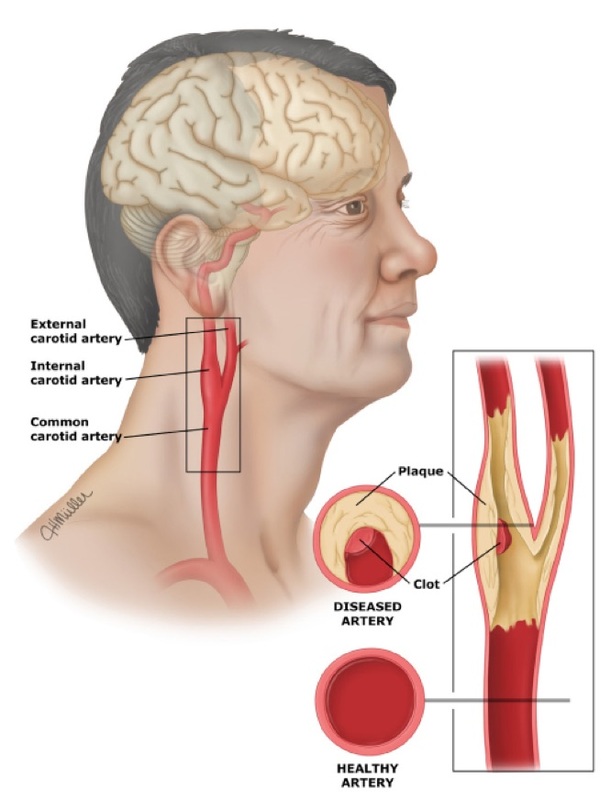 One way that blood flow can be restricted to the brain is through narrowing of the blood vessels, for example in the carotid arteries. Blockages in these arteries, severely increases a person’s risk of having a stroke. A stroke is when a part of the brain becomes damaged due to problems with blood flow in the brain. Blood clots or the fatty plaque deposits can break off and travel to smaller blood vessels in the brain, where it can cause a blockage and lead to a stroke. A stroke may also occur when an artery breaks open causing excessive bleeding into and around the brain. Face – Does the face look uneven or droop on one side? Arm – Does the person have weakness or numbness in one or both arms? Speech – Is the person having trouble speaking? Does the speech sound strange? Time – If you notice any of these signs, it’s time to call the ambulance. Peripheral artery disease (PAD) is narrowing of blood vessels around the body reducing circulation to body parts other than the brain or heart. PAD mainly affects blood vessels in the legs. A symptom that you may have PAD is claudication. Claudication means “to limp” and is the development of deep pain in the leg muscles, including buttocks, thighs, and calves, and this can occur during activity. The pain in the legs goes away after resting. Like cerebrovascular disease and coronary artery disease, PAD occurs as a result of atherosclerosis. The fatty plaque deposits block blood flow to the legs, including the muscles and skin. Like macrovascular disease, ongoing high blood glucose levels are an important risk factor for the development of microvascular disease in patients with type 2 diabetes. Retinopathy, nephropathy, and neuropathy are all progressive disorders. These complications won’t be noticeable at the beginning as they don’t produce any symptoms during the early stages. They can also be prevented, or the severity minimized with the combination of regular medical check-ups and adequate blood glucose management. Similar to macrovascular complications, microvascular complications can increase with ongoing poor blood glucose control as well as the duration that you have had diabetes. This means, the longer that you have had diabetes and the longer you have had high blood glucose levels, means that you are more likely to develop diabetes-related complications. So! The earlier that any of these complications are detected, means that early intervention can occur which may be able to reverse any of these microvascular diseases or help to delay further progression. Eye problems in people with diabetes, is known as diabetic retinopathy. It can lead to loss of vision and even blindness (Diabetic Retinopathy). Retinopathy affects the small blood vessels of the retina at the back of the eye. For most people, retinopathy will have no symptoms until the disease is quite advanced. Unfortunately, by then there is little that can be done about any vision loss. This is why early detection is so important. There are three stages of retinopathy. Most people who have type 2 diabetes develop the mildest form (nonproliferative retinopathy). For some people, this can progress to the intermediate stage of retinopathy (pre-proliferative retinopathy), or even to the advanced stage of retinopathy (proliferative retinopathy) which carries the highest risk of blindness. Did you know that in the United States, diabetic nephropathy is the leading cause of kidney failure? (Microvascular and Macrovascular Complications of Diabetes). Diabetes-related nephropathy affects the small blood vessels in the kidney, which can alter the normal function of the kidney. The kidneys are responsible for filtering our blood and removing any waste products and excess salts and water from our blood. When the kidneys are functioning normally, they prevent protein leaking into our urine. So, if there is protein found in the urine, this is often the first sign of nephropathy. Diabetes-related neuropathy is also a progressive disorder affecting our nerves. Nerves have important roles in our body, as they act to transmit signals all over our body. Our nervous system has a wide range of jobs including, controlling our heart rate and blood pressure, as well being responsible for nerve conduction and sensory perception. Did you know that 10-18% of adults with type 2 diabetes show signs of nerve damage by the time they’re diagnosed with diabetes? As discussed in symptoms of type 2 diabetes, the most common sign of diabetes is nothing at all. It can sometimes take 5-10 years before someone is diagnosed with diabetes, and by that point they may already have symptoms of reduced nerve function. Diabetic neuropathy can lead to amputations in some people with diabetes. It has been found to be responsible for more than 80% of amputations that occur after a foot injury or foot ulcer, which can result from diabetic neuropathy (The Association Between Cardiovascular Autonomic Neuropathy and Mortality in Individuals with Diabetes). If you have diabetes, you will require ongoing check-ups to monitor for any diabetes-related complications. These routine examinations are important as early detection of any microvascular or macrovascular complications can lead to early interventions and treatment that may be able to reverse complications or prevent them from progressing further. Routine eye exams help to monitor changes in the blood vessels in the eye. They’re important as diabetic-related retinopathy may lead to blindness in some people who have type 2 diabetes. Dilated eye exam - Your doctor will use special eye drops that help to open up your pupils, allowing them to examine the retina at the back of the eye. 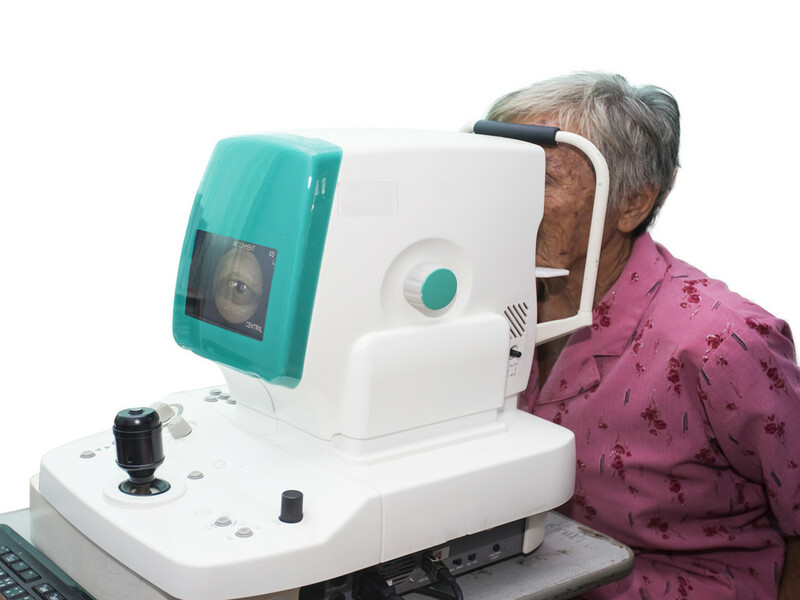 Digital retinal imaging - Using a special camera, a technician will take pictures of the back of your eye, before sending the images to a specialist eye doctor. If you have type 2 diabetes, you should have your eyes checked regularly as soon as you are diagnosed with diabetes. If you already have retinopathy, you will need to get your eyes checked at least once a year, possibly more, however your doctor will decide what the best schedule for you is. Foot problems are a common occurrence in people with diabetes. With proper care, these foot complications can be prevented, so if you have diabetes, your feet need to be visually inspected whenever you see your doctor. These visual inspections can help to identify any problems with your toenails, fungal infections, or ulcers caused by poorly fitting shoes. 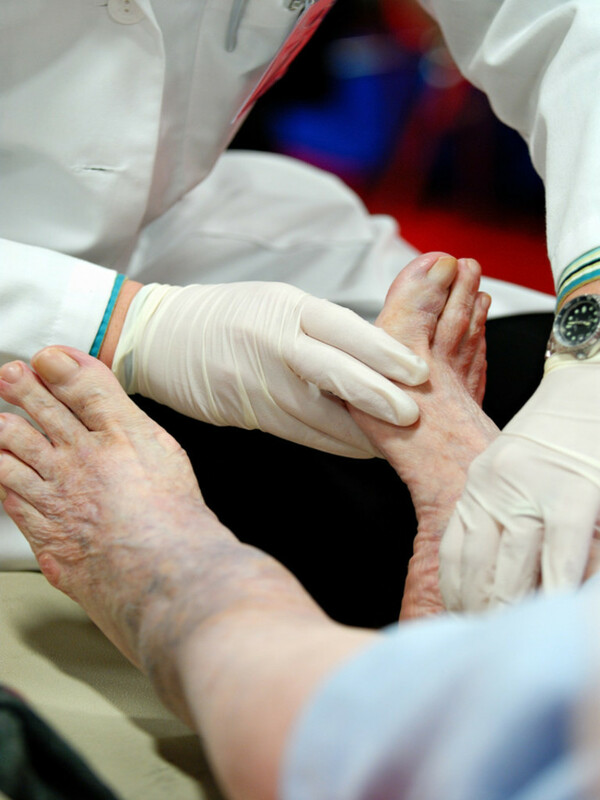 As well as regular foot examinations, a comprehensive foot exam should be performed annually to identify any risk factors that could lead to ulcers and amputation. It is important that you inform your doctor of any changes that you may have noticed with your feet. You can also conduct foot exams at home. Self-care is essential when it comes to foot care, and in this instance, the patient becomes a vital member of the healthcare team!